"There are many problems in ministry for an Episcopal clergyman and rector of a parish in New York City, but the problem that has been the most challenging to me is the regular practice of creating, researching, writing, and delivering sermons. I am sure that I am not alone in my own or any other denomination, but two reasons appear to make my personal struggle in preparing sermons more difficult than some. The first concerns the worship tradition of the Episcopal Church; as part of the Anglican Communion, it is, by and large, a liturgically-centered community of Christians. The second is my personal inclination to be a "one-method" preacher, a captive of habits of preparation accrued in the more than twenty years since my ordination." "The heaviest responsibility carried by the minister is preaching, for preaching is sacramental. In this volume one of this generation's most exciting preachers has illuminated his own methodology in constructing seimons and gives us the clue to understanding the secret of effective preaching. There is an integrity in Dr. Hunt's method that is instructive and inspiring." "A detailed account by a conscientious clergyman of his effort in mid-career to increase his effectiveness in preaching by a studied examination of the aims and difficulties, and of various techniques and methods, of sermon making. It should prove an aid — and perhaps also, because of its honesty, an inspiration — to other clergy struggling with the craft of their profession." "The strength of Sermon Struggles is the invitation it presents to share in the actual craft of sermon construction. This invitation is enhanced by the personal experiences scattered throughout the book. It is commendable for the seriousness which it gives to theological reflection throughout. 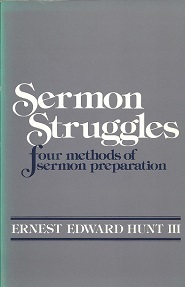 With the renewed emphasis on the importance of preaching in the church, Ernest Hunt's book will be of use to many."